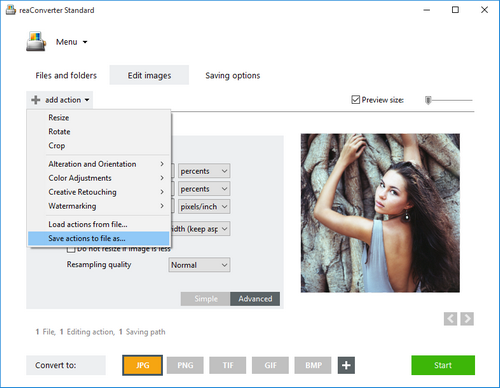 Configuration (.cfg) and action (.act) files are particularly useful for users who plan to automate the image conversion and editing process, especially when dealing with large numbers of images. These files store information that can be later on used with the Watch Folders feature, Right-click conversion or when operating reaConverter through Command-line. 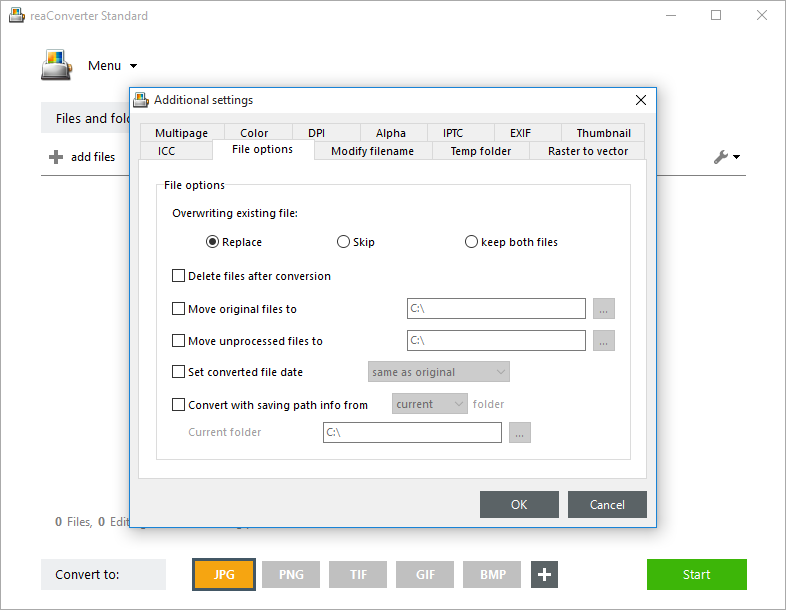 Configuration files contain details about the output extension of the converted images and the destination folder, as well as other additional features, such as file name modifications or conversion options (transparency color, loading settings, saving settings, etc.). 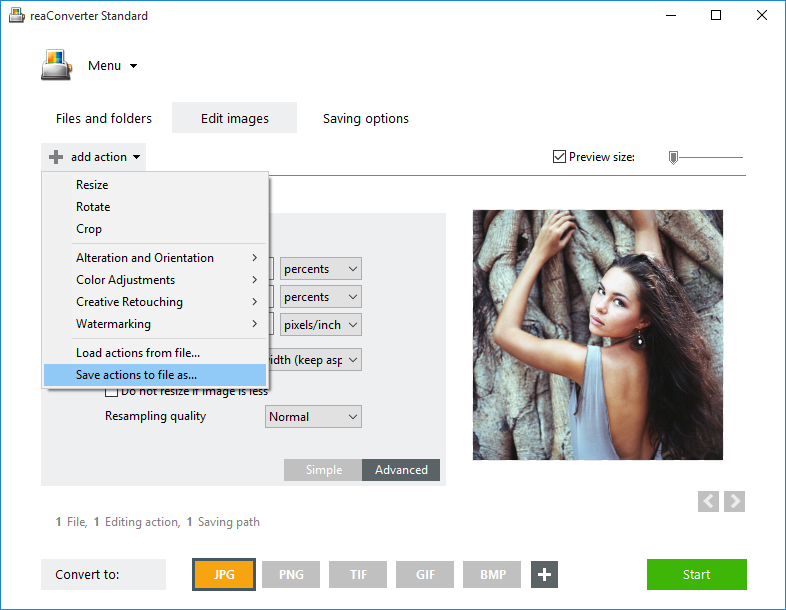 Action files include the actual editing actions that will be applied to images, such as resizing, cropping, rotating, adjusting white balance, watermarking, etc. The .cfg and .act files can be created using any text editor, but it is easier to create them using directly reaConverter. To create a .cfg file, start by selecting the desired output format from the buttons placed in the lower part of the screen, and the destination folder, from the Saving options section. 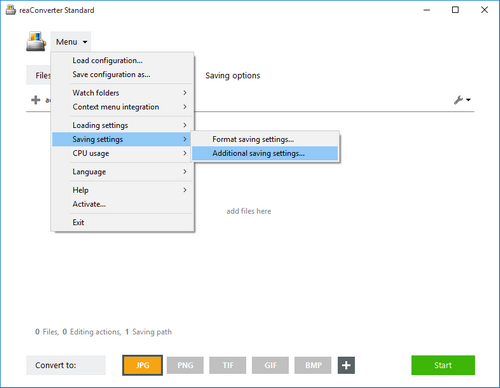 You can also add here additional commands which can be found under Menu → Saving settings → Additional saving settings, such as Delete files after conversion or Modify filename. Next, go to the Menu button and click Save configuration as..., and your .cfg file is ready! To create an .act file, go to the Edit images section and select one or more editing features from the Add action button. Then press Save actions to file as..., and your .act file will also be ready. After creating the Configuration and Action files, you can use them to operate the Right-click conversion, Watch Folders and Command-line. 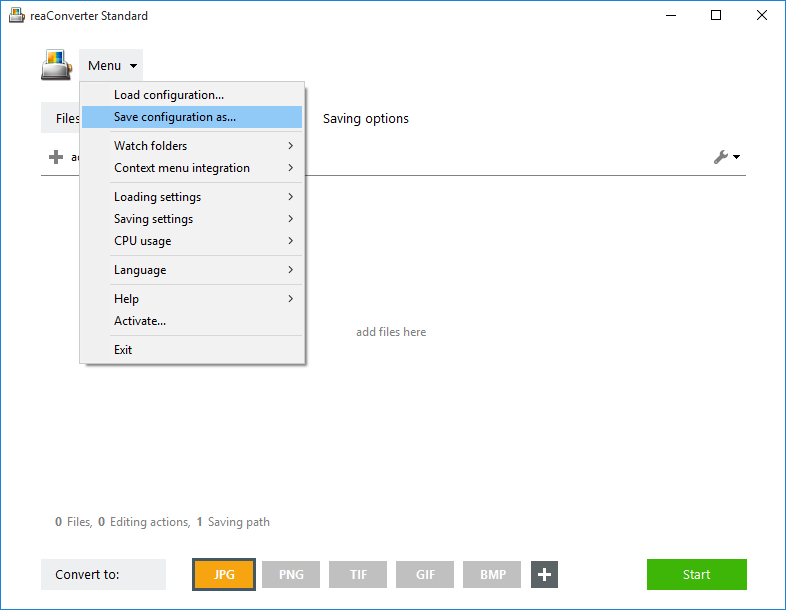 In the attached video tutorial you can see how to create a Configuration file that includes 3 different features (output format, destination folder and the "delete files after conversion" command), and an Action file consisting of 3 editing features (resize, rotate, mirror).